Inexpensive family-room and bunkroom accommodations (106 bunks in all, shared bathrooms) and simple but hearty meals for hikers in the midst of New Hampshire's White Mountains. 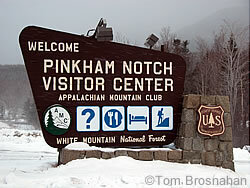 At the Appalachian Mountain Club's Pinkham Notch Visitor Center - Joe Dodge Lodge, 9 miles (14.5 km) south of Gorham NH, 11 miles (18 km) north of Jackson on NH 16 (map), people of all ages can find inexpensive family-room and bunkroom (dormitory) accommodations (106 bunks in all, with public toilets and shower rooms) and simple, hearty meals. The lodge is open to all, whether AMC members or not, but AMC members pay discounted rates. Note that you must have reservations (tel 603-466-2727, Monday to Saturday, 9 am to 5 pm), and they must be paid in full at the time of reservation (credit cards accepted). Click here for rates and refund terms. Children 12 and under receive a discount for the beds and meals, and as a convenience the kitchen will make up trail lunches. If you'd like a room alone, you will have to pay for each unused bunk in the room, if others are turned away as a result. In July and August rooms beds can be in great demand, so reserve in advance during those months, and at least check bed availability in other months. (Click here for info on AMC membership).